While it might still feel a little warm out there to exchange soup recipes before we know it the leaves will be turning, the pumpkins will multiply, and those warm summer nights will morph into cozy evenings by the fire. Heres your chance to get a jump on your Fall décor with these simple decoration ideas: Wreaths compliment a variety of décor styles and can be changed out to represent each season. Gather some pine cones, colorful leaves, branches, and colored ribbon and make your own or check out Pier One, World Market, Amazon, or Homegoods for a bountiful supply on fall décor. Plaid is synonymous with Fall and can be found in a variety of décor items from blankets and pillows to dishes and napkins. Display and consume colorful apples, pumpkins, gourds, and squashes. Arrange in a glass bowl and enjoy a pop of natural color in your dining room. Create a portable centerpiece with ingredients taken from your own neighborhood. Gather leaves, branches, dried flowers, and miniature pumpkins and arrange them on a rustic tray. Add to your display as the season progresses and the colors of the leaves change again and again. Create a garland out of dried corn and husks. Who knew corn was so versatile? Check out this craft from Martha Stewart Living and greet your guests at the door with this colorful garland. Add a pop of color to your fireplace with a row of pumpkin candles and mini pumpkins along the mantle. If you have a wood-burning fireplace, nows your chance to stock up and decorate with decorative wood baskets. Try placing them on corresponding accent rugs for an extra cozy feel. Bling out a pumpkin with fall leaves that have been glued on to the pumpkin and painted with metallic glitter. Change out pillows and add flowers for an instant seasonal update. Create a dramatic entryway with multi-colored pumpkins. Create a seasonal wall and decorate with warm, earthy colors, fall décor, and Thanksgiving photos and memories. Now that you have a few fall decor ideas to get you started, what are you waiting for? Hashtag #LifeAtWeidner and show off your fall-inspired home decor, we'd love to see how it turns out. 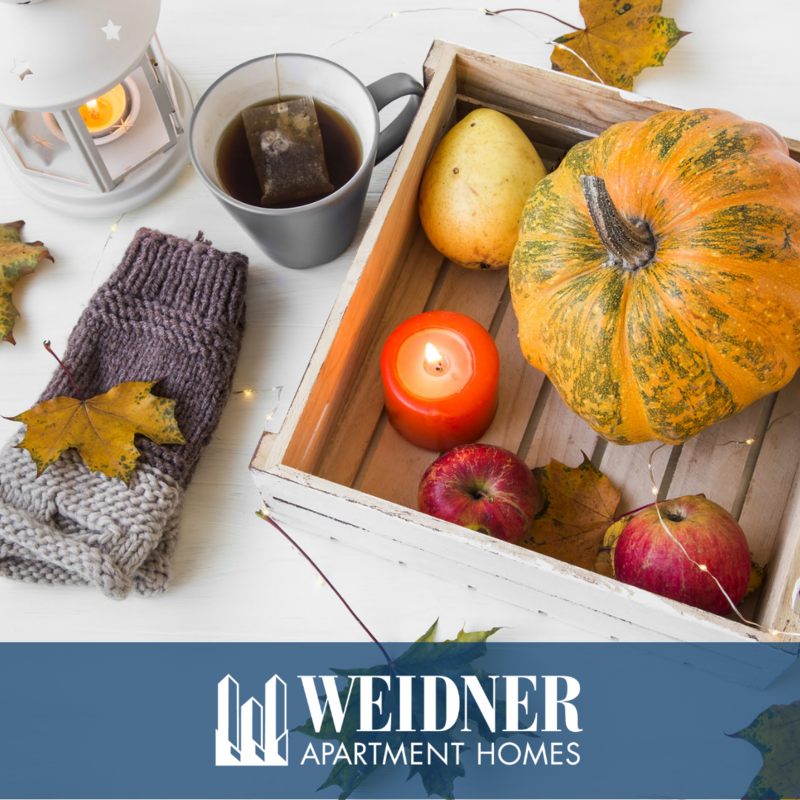 From all of us at Weidner, Happy Fall!